**Live Wire** Jihad in Orlando: How Can We Prevent Another Pulse Massacre? 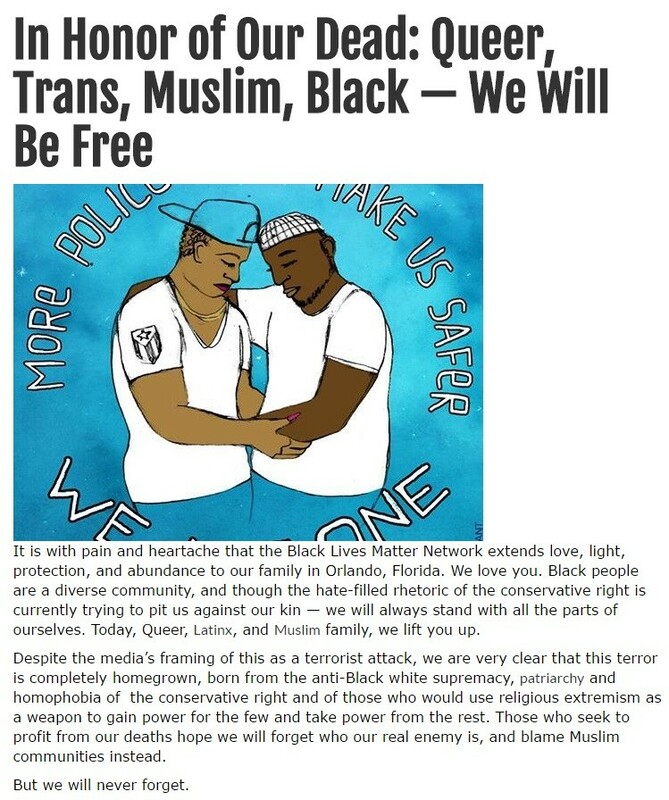 Breitbart News presents live coverage of the aftermath of the jihadist Omar Mateen’s massacre at Orlando’s Pulse night club. Two days after the largest terrorist attack on U.S. soil since 9/11, debates rage over immigration from Islamic-majority nations and expanded gun control. 10:25 PM — On Fox News, Trump again hammers Clinton for her hypocrisy, saying she takes millions from countries where people throw gay people off of buildings. Trump again mentions that second- and third-generation Muslims aren’t assimilating and there is a percentage of people in the country who want to do what the Orlando terrorist did. 10:02 PM — The Orlando terrorist reportedly had been watching ISIS beheading videos and other ISIS propaganda. 9:35 PM — Sanders, Clinton having their meeting in D.C.
9:25 PM — Orlando terrorist reportedly checked his Facebook page while carrying out attacks and pledging allegiance to ISIS. Just now. @CBSNews has learned that during the Orlando attack shooter Omar Mateen was pledging allegiance to ISIS on his Facebook page. 8:42 PM — On CNN, David Gergen says Trump has a point arguing that Obama doesn’t refer to radical Islam. 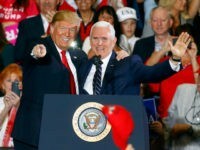 He mentions that President Reagan called the Soviet Union the “Evil Empire.” Gergen said he thought he shouldn’t have but “in the end, he was right because it clarified what we were against and what we were fighting.” Gergen says when we are facing evil, you should’t be afraid to call it what it is. 8:30 PM — Clinton projected to win D.C. primary. 8:00 PM — Polls in Washington, D.C. for the Dem. primary have closed. Trump rains insults on Dems tonight in North Carolina. Mocks Kerry for bicycle accident. On Obama: "one hell of a lousy president." 7:10 PM — Trump says Clinton “sort of” used “radical Islamic terrorism” and says we have a “radical Islamic problem.” Trump says after Obama’s speech, the only thing people thought was “boy, does he hate Trump.” Trump laments the lack of assimilation (The Orlando terrorist, who was born in America, referred to Afghanistan as “his country.”). 7:06 PM — Trump says because Clinton is no friend of women and LGBT Americans because she is taking millions from countries that oppress LGBT folks and women. “That’s the kind of anger that he should have for the shooters and the killers who shouldn’t be here” Trump says. 7:01 PM — Trump says Clinton is “weak” and “ineffective.” Trump says Clinton wants 550% more refugees. “We don’t know who they are and where they are coming from,” Trump says. He adds that the refugees are being “snuck into certain communities” and even the governors don’t know who is coming in and where they are coming from. 7:00: PM– THE KING (Richard Petty) endorses Trump and is at Trump’s North Carolina event. 6:55 PM — These people just don’t give up. 25 hours after we broke possible arrest- Fox News reporting Grand Jury has been called for Pulse shooter Omar Mateen's wife. 6:33 PM — Mainstream media or Dem. rapid response? 6:10 PM — Obama still hasn’t called Florida Gov. 5:45 PM — Mainstream media reporters like Chuck Todd really really really don’t want this to be an act of Islamic terrorism. He asks a leading question to Rep. Peter King (R-NY) on “MTP Daily,” saying that the terrorist was “mentally unstable or closeted.” He asks if this terror attack is “less and less looking like something directed from overseas.” King doesn’t take the premise of the question and says he wouldn’t “minimize” the threat of radical Islam like that. He says ISIS has a way of inspiring mentally unstable people. I've never seen Obama that angry. Ever. 70% in Bloomberg/Selzer poll say they're bothered, at least a little, that Clinton's private server wasn't "allowed" by State, per IG. 4:39 PM — This witness’s comments after the shooting about how the Orlando terrorist said he was the “fourth shooter” and had a female accomplice who may have had a “bombing vest” are more interesting in light of today’s news about the terrorist’s wife potentially facing criminal charges. Active shooter in Amarillo Walmart ended when SWAT team shot the suspect. Cops outside report letter in suspect's car written in "Arabic." 4:15 PM — Sen. Bob Corker (R-TN) showing his establishment GOP true colors. According to court records, in 2006, Omar Seddique legally changed his name, adding "Mateen" as his surname. 4:01 PM — Four-star accommodations… on a security guard’s salary? Was someone bankrolling his trips to Saudi Arabia? 3:59 PM — Trump on Hannity’s radio show. 3:53 PM — Another left-winger, Roland Martin, sees through NBC’s spin. 3:47 PM — Don’t forget it! 3:43 PM — The never-ending “who is the bigger victim?” hot take war. 3:34 PM — Daily Beast/CNN contributor seeing past NBC’s spin. “[Omar’s father Siddique Mateen] served as a director and vice president” of the mosque attended by his son, which authorities describe as a “breeding ground” for jihadists, reports CounterJihad, a component of the Center for Security Policy. 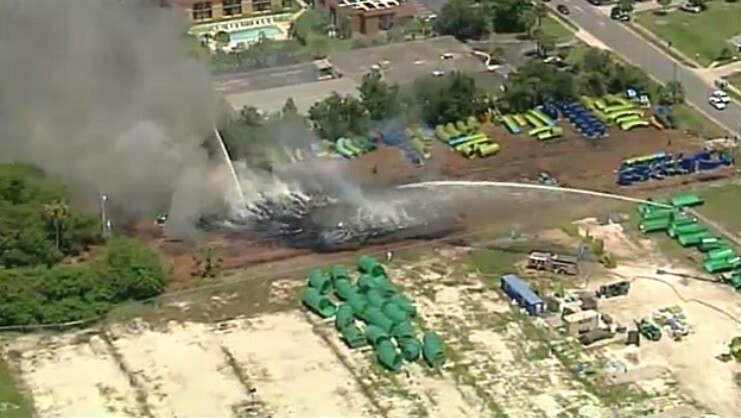 2:52 PM — Details on Orlando fire from local newscaster. Source at Universal tells me the fire is in an empty lot where they were storing equipment for the new Volcano Bay attraction. Started as a 6ft fire and then ignited into the massive blaze. 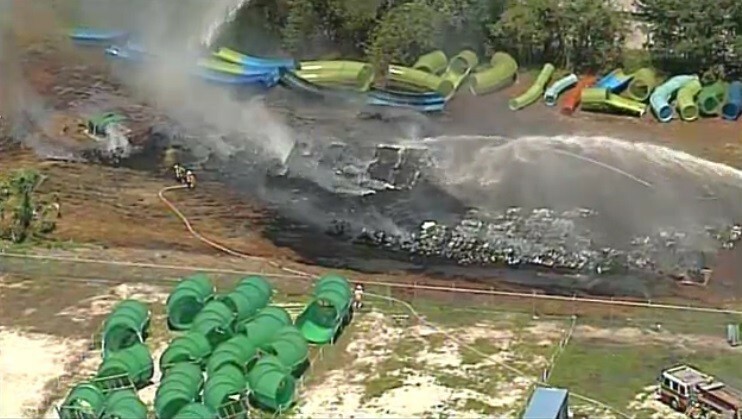 Contact predicts $2-3million dollars worth of rides destroyed, but they will better asses the situation when fire is out. Says the fiberglass on the rides helped fuel the flames. 2:50 PM — Fire looking contained. 2:46 PM — Elementary school teacher says Mateen’s father told the young boy he did not have to listen to women. Omar Mateen’s elementary school teacher did not want to be identified for fear of retaliation. She says Mateen is a student that left a lasting impression on the entire staff at Mariposa Elementary and not a good one. She went on to say his father often told Omar that he did not have to listen to women. This created a barrier for the staff predominately comprised of woman to help a child they say they knew early on had a tendency to be violent and would often lash out. 2:45 PM — Wider angle. 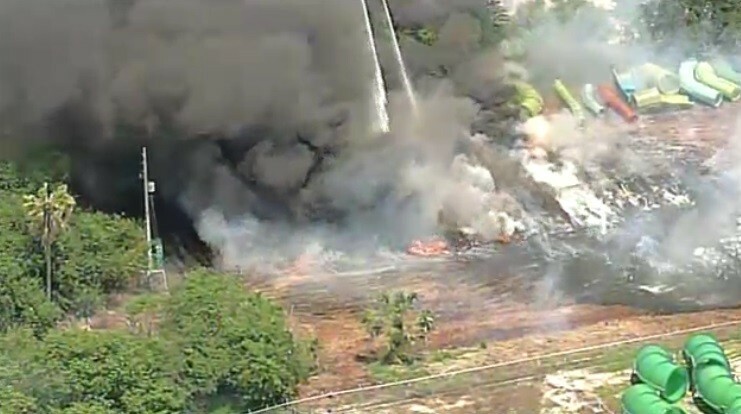 2:42 PM — Aerial view of the fire. 2:37 PM — First videos. 2:31 PM — Closer picture. 2:26 PM — Large plume of smoke visible in Orlando. Identified by some on social media as Universal Studio Theme Park. 2:20 PM — Update from the father. Spoiler alert: he knows nothing! “I can’t say what she knew, when they last talked or what they talked about,” Seddique Mir Mateen said Tuesday of his daughter-in-law, Noor Salman. Salman would not be giving interviews anytime soon but a “family apology” would be forthcoming in the near future, Seddique Mir Mateen said in an 11 a.m. interview at the front door of his Port St. Lucie home. 2:15 PM — “Big rhetorical guns”… the day after Trump calls her out for just offering words to the victims. Sad! 2:12 PM — “Prayers don’t fix anything!” -angry celebrities on Twitter. Publisher and entrepreneur Jacob Engels will hold availability at 4:15pm at 1742 S. Orange Avenue to discuss the implications of the terrorist attack at Pulse Nightclub on the presidential election, what it means to gay conservatives, and how to move forward. Mr. Engels will speak on behalf of thousands of gay conservatives who call Central Florida and Orlando their home. “We must place the blame and responsibility of this heinous attack on Omar Mateen and anyone who aided or abetted his efforts,” he states. For further comments and press availability, please call or text 231-360-1411. 1:57 PM — New: FBI really dropped the ball on Mateen’s connection to first American suicide bomber in Syria. The relationship between Orlando terrorist Omar Mateen and an American suicide bomber in Syria was much “deeper” than previously understood by federal investigators, according to a government source. Fox News was told the relationship as well as the Mateen case in general are “very complex” but would not go further, citing the sensitivity of the FBI investigation and classified information. The source said the bomber’s return to Florida in 2013 is under fresh scrutiny as well. FBI Director James Comey told reporters Monday a witness had identified Mateen to the FBI during their investigation of Abu-Salha and claimed Mateen was watching videos from the American cleric Anwar al-Awlaki, an Al Qaeda terrorist targeted for death by the CIA in 2011. 1:55 PM — Mosque attendee contradicts imam, suckers lefty reporter. Spoke to an attendee at the Fort Pierce mosque that's been linked to Omar Mateen. He's very upset Mateen has been tied to the mosque. The man I spoke with said he's been going to this mosque for 3 years and never saw Mateen. Said there's no way he was a regular member. “The horrific attack in Orlando was the second act of radical Islamic terrorism inspired by ISIS to be carried out on our shores in six months. Let’s not forget: President Obama’s hasty and politically-driven withdrawal from Iraq, which Hillary Clinton supported, created the vacuum that enabled the rise of this terrorist group. Their failure to secure Libya after their military intervention gave ISIS a beachhead on another continent. Democrats want to talk about anything else because they have lost the national security debate. Mourners from all over the country have been showing support for the victims of the Orlando club shooting, and now reinforcement is being sent of the four-legged kind. Gracie, a 5-year-old golden retriever, is a Lutheran Church Charity K-9 Comfort dog based out of Davenport, Iowa. She’s been specially trained to ease human suffering. 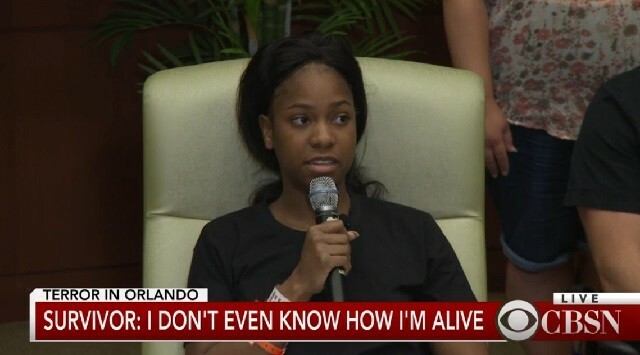 1:42 PM — Carter: “I was begging God to take the soul out of my body” because of the pain from her gunshot wounds. 1:36 PM — “Honestly, I don’t believe he could have pulled it off all by himself,” Carter says. Cites Mateen’s threats to the police that he had “snipers” outside. 1:31 PM — “The reason he’s doing this [he says] is that he wants America to stop bombing his country.” Says Mateen began speaking in Arabic. 1:23 PM — Pulse massacre survivor from Philadelphia Patience Carter reading a poem she wrote about her experience — very vivid imagery about blood, debris, seeing the feet of the killer. “The guilt of being alive is heavy,” it concludes.
.@Patience326_: Says her friend Googled popular nightclubs and Pulse was at the top of the list. Her friends parents dropped her off. 1:17 PM — New York Daily News sees past NBC spin. In the aftermath of Orlando, hard-edged religious conservatives are facing a dilemma. How can they call for a redoubled assault on “radical Islam” without drawing attention to their own homophobic history? 1:02 PM — Police cancel Milo’s talk tonight thanks to Islamist threats. 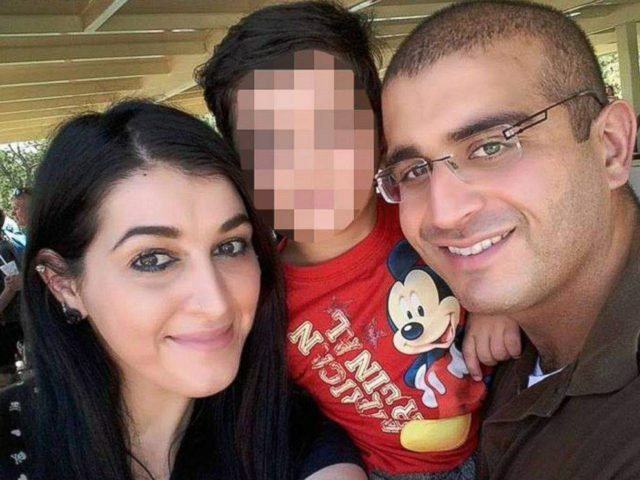 12:52 PM — Report: Mateen’s wife facing arrest. 12:51 PM — It’s like that SNL “Really!? !” Weekend Update bit, just by, um, the leader of the free world. 12:41 PM — Obama praising diversity of a graduating class of cadets. 12:40 PM — Obama says his critics are a threat to Constitutional liberties, the rule of law, etc. 12:37 PM — After a rabbit trail on gun control, Obama spends the lion’s share of his address attacking Donald Trump — first, the criticism of his refusal to say “radical Islam.” Now the proposal to halt immigration from Muslim nations. 11:52 AM — NBC’s spin already collapsing. 11:38 AM — Reporter asks doctors about the process of buying firearms. Top-notch journalism. 11:35 AM — NBC News is pushing the “tried to talk him out of it” talking point at the top of all their coverage. That is not the story. The story is that she could have prevented the massacre by talking to law enforcement and she did not. 11:30 AM — NBC: Police considering filing charges against Mateen’s wife. 11:29 AM — Colon is asked whether he had seen Mateen before at the club and says that he had not personally. Colon on shooter prior visits to Pulse. "I have not seen him…but it scares me, knowing that someone like this was constantly in the club." 11:18 AM — And more. 11:16 AM — With three hours to bleed out, no one will be. 11:15 AM — Curiously omitted from this new detail: did she report him to authorities? 11:12 AM — Why isn’t this woman in jail? NBC News has learned that Mateen's wife tells FBI she drove him to Pulse nightclub in days before attack but tried to talk him out out it. 11:10 AM — That figure of “202 rounds fired overall” just gets more and more implausible. 11:08 AM — Obama will be in Orlando Thursday to counter all the truth bombs dropped by Milo Yiannopoulos tonight. President Obama will travel to Orlando on Thursday. Where many of the Pulse victims were shot, per dr: "wounds to the chest, wounds to the abdomen, wounds to the pelvis area"
11:03 AM — Always with those mis-translations. 10:59 AM — Hospital staff says that victims were transported quickly thanks to their proximity but that meant workers did not have much time to prepare, and the facility was already a high-activity site. However, worker after worker who was not scheduled to work that night volunteered to show up and help. #Orlando trauma surgeon says after 1st patient came in stable, 4-5 came in that they were unable to save. 10:46 AM — Survivor Angel Colon speaking at press conference says that Mateen was shooting bodies on the floor to confirm his kills. Says that miraculously, he was shot in the hand and the hip instead of the head. The men said that police arrived within minutes, and that the shooting lasted about an hour. Authorities said Mateen called 911 and the scene turned into a hostage negotiation. As McCoy waited for word of her friends outside, she grew furious at the Orlando police. “I was flipping out on the cops,” she said, telling them to go inside and rescue people who had been shot. 10:23 AM — They can’t spin it much. Evidence is building from a variety of sources that Orlando jihadi Omar Mateen, who murdered 49 people at gay nightclub Pulse, was himself gay, or had “gay tendencies,” as his ex-wife put it. Strangely, the ex-wife claims FBI agents asked her not to share this detail with the media. 10:13 AM — A clearer picture of the night emerges — NYTimes interviews a survivor who played dead in the bathroom while Mateen carried out his rampage. Orlando said he never looked Mr. Mateen in the eye, but recalled his calm voice. At one point, after noticing that some of the hostages in the bathroom were texting, the gunman ordered them to surrender their phones. 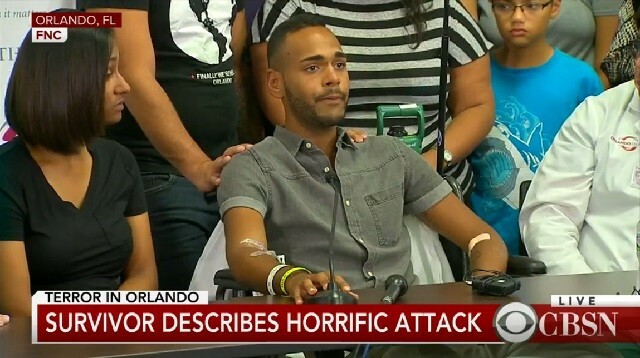 “He said, ‘I don’t have an issue with the blacks,’” Orlando said. Early in the siege, the gunman called 911 to pledge his allegiance to the Islamic State, Chief Mina said. “He was cool and calm when he was making those phone calls to us,” he said. Orlando could hear the gunman speaking on the phone, presumably to the police. He spoke about how America should stop bombing the Islamic State. “He got mad and hung up,” Orlando said. He never heard Mr. Mateen mention gay people — he spoke only about the Islamic State and Syria, and about the damage he still intended to do. 10:01 AM — Too many takes! 9:57 AM — Hottest take yet. 9:53 AM — Pretty damning report from NBC. Law enforcement experts say the three-hour police wait definitely led to more deaths. The decision by law enforcement to hold off on entering the Pulse club — where more than 100 people were shot, 49 of them killed — immediately raised questions among experts in police tactics. They said the lessons learned from other mass shootings show that officers must get inside swiftly — even at great risk — to stop the threat and save lives. “We live in a different world. And action beats inaction 100 percent of the time,” said Chris Grollnek, an expert on active-shooter tactics and a retired police officer and SWAT team member. Grollnek, a consultant who conducts active-shooter training for law enforcement, said that’s another lesson from other mass shootings: Civilians can’t expect to stay safe by heeding the old advice to hide or shelter in place. A crowdfunding campaign to support the Orlando Pulse shooting victims and their families has pulled in more than $3 million. 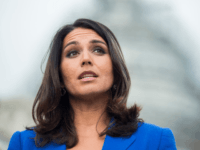 The campaign is GoFundMe largest ever, dwarfing the previous record of just over $2 million. The charity site was started in 2010. Equality Florida, the largest LGBT rights group in the state, posted the GoFundMe fundraisershortly after a gunman killed 49 people and injured dozens more at a gay club in the deadliest mass shooting in U.S. history Sunday morning. An earlier death toll of 50, released by officials, had included the gunman. By Tuesday morning, more than 69,000 people had made contributions. That included a $100,000 donation from GoFundMe, which essentially waived its transaction fee. 9:39 AM — Rep. Michael McCaul frets that Trump may be recruiting terrorists with his scary rhetoric! The proposed ban on Muslim immigrants had already been rejected by Speaker Paul Ryan (R-Wis.) and the overwhelming majority of Republicans in Congress. But House Majority Leader Kevin McCarthy (R-Calif.) said again he wouldn’t support it, and that he had no interest in seeing it get a vote. 9:22 AM — From Frances Martel: Video of the Univision reporter that went into Mateen’s house getting attacked by a giant cockroach and taking it in stride. Florida Governor Rick Scott (R), speaking near the scene of the slaying, said Tuesday that investigators were working diligently to sort out what happened and why. He said he had been focused on talking to victims’ family members. He did not offer any new details on the status of the investigation. Scott also called for the federal government to share more information with their state counterparts in the wake of the shooting. While he did not specify how more sharing of information might have prevented the massacre, Scott said it was broadly important that federal officials share what they learn with local law enforcement — especially in immigration or refugee cases. 8:52 AM — New left-wing narrative emerging.